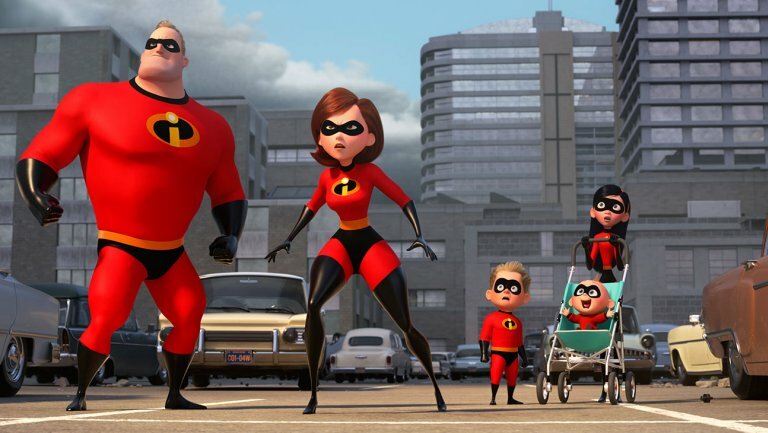 Note: Incredibles 2 contains a sequence of flashing lights that may affect viewers who are susceptible to photosensitive epilepsy or other photo sensitivities. 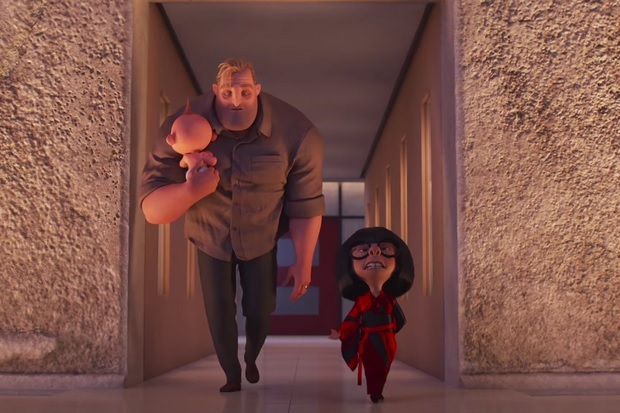 Writer/director Brad Bird (Mission: Impossible – Ghost Protocol, Tomorrowland, Ratatouille, The Iron Giant) returns to helm Incredibles 2 as the plot picks up right where the 2004 original left off with The Underminer, voiced by Pixar mainstay John Ratzenberger (TV’s Cheers), causing havoc that this superhero family and close friend Frozone must quell along then the mysterious Screenslaver villain. Set during 1964 (confirmed by specific references), this sequel features the Parr family and Lucius Best (a.k.a. Frozone), well voiced by Samuel L. Jackson, encountering telecommunications tycoon Winston Deavor, voiced by Bob Odenkirk, becoming a strong ally for superheroes. Winston runs his company with his tech genius sister Evelyn, voiced by Catherine Keener. Bob, voiced by Craig T. Nelson, soon becomes a sleep-deprived Dad as the family matriarch Helen, voiced by Holly Hunter, gets chosen for a hero restoring campaign. As Elastigirl, she’s preferable over Mr. Incredible and Frozone due to the limited damage she creates. Jack-Jack’s voice by Eli Fucile is all archived recordings while the most famous off-screen character, Honey Best, is voiced again by LaTanya Richardson Jackson. If these characters are ever aged, then Jack-Jack would easily be at the forefront based on several revealing new powers that are used well for dramatic and comic effect. Superhero relocation superior Rick Dicker is now voiced by Jonathan Banks who took over for the late Bud Luckey. New characters include Voyd, voiced by Sophia Bush, along with other superheroes while Isabella Rossellini voices The Ambassador. 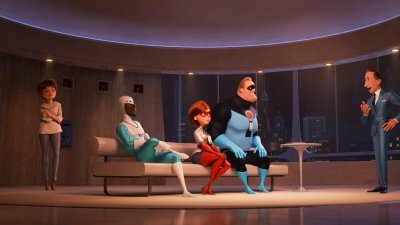 Even at a considerable 118-minute run time, Incredibles 2 needs more character development, especially for Frozone, Bob and Dash. Audiences will likely encounter a surprising character twist while the themes and tones are a bit dark and overtly political. The Michael Giacchino music score keeps the thrills and continuity going. The film’s visuals are truly incredible, especially the motorcycle sequence with Elastagirl that take full advantage of the animation medium showing stuntwork and action otherwise impossible. The color schemes and animation techniques really shine, especially an interior fight sequence. Bird also voices superhero fashion designer Edna Mode and adds to the comedic enhancements in the film. Michael Bird, Brad Bird’s oldest son, returns to voice Tony Rydinger, Violet’s classmate in an expanded role that helps progress the plot well. Enhancing elements include subtle references in the set design (e.g., a large painting in Helen’s hotel room, Municiberg Credit Union, etc. ), Mr. Incredible’s car, and family challenges ranging from dangerous threats to Common Core math. The reference to “an eccentric billionaire who wanted to enter and leave his home unnoticed” also seems to reference the remote-loving villain Syndrome. The animated action adventure film Incredibles 2 is Pixar Animation’s 20th film and is a great family adventure that comes recommended (*** out of four stars) and rated PG for action violence and mild bad language. Audiences can enjoy the short film Bao before the show. Also showing in 3D and IMAX theaters. This entry was posted in 2010s Film Reviews, Film Reviews and tagged Disney, Film, Incredibles 2, Michael Siebenaler, Mike Siebenaler, Pixar, Tall Writer. Bookmark the permalink.